It’s here – the best, cheapest & nicest way to see Hobart. Take a self-guided tour to enjoy all this magnificent city has to offer. Grab one of our maps (or see the ones here) and tips and take a tour! Take an effortless Electric Bicycle or comfortable Hybrid 21 or 24 speed city bike. Historic Tombstones in St Davids Park. There’s a very, very easy 12 km cycle (12 km with an electric bike is a cinch!) along the beautiful Hobart cycleway, visiting the breath-taking Hobart Botanical Gardens and on to the Museum of Old and Modern Art. You’ll be amazed at this remarkable museum that has captured the imagination of international visitors. It’s one of the best things to do in Hobart (beside ride there on a hire bike!). It even has a great coffee shop/restaurant where you can sit and relax before your fun ride home. You can finish off with a gentle ride back into the centre of Hobart and enjoy the magnificence of this great city OR hitch a ride back down the river on the MONA ROMA FERRY a superb way to finish the tour. 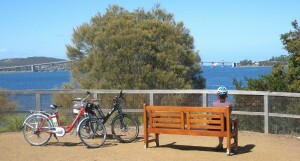 There are around 20 wonderful kilometres of foreshore bike track on the other side of the harbour from the city. The winding track follows the coastline, you can stop at the fantastically located Waterfront Hotel at Bellerive for lunch and continue round the coast to the famous Blundstone Arena and some wonderful white sand beaches. Just a few short kilometres from the City of Hobart is a beautiful and quiet haven. Tasmanian Botanical Gardens are the first stop, the beautiful Japanese garden is a highlight. Very nearby is the peaceful Cornelian bay with its colourful boathouses sheltering along the coast. There is a gravel track to a scenic lookout. You will not believe you are only 3km from the city. A little further along, turn off for the Historic Runnymede House. Operated by the National trust, this lovely museum has limited opening hours, but is well worth a visit. If you need a pick-you-up, great coffee and pastries are available at the imaginative Tracks Cafe, which is right on the bicycle track. Does anyone in your party like ICE CREAM?, a few km’s further along the cycleway is the Valhalla Ice Cream Factory and shop (Closed Mondays). Riding UP Mt Wellington is a challenge for very fit riders with plenty of time to spare. It is 20 km from the city and 1350m altitude at the pinical. It is possible for you and a group of friends to RENT a MAXI TAXI for around $50, rent low priced bikes from Hobart Bike Hire and be delivered to the top of the mountain. 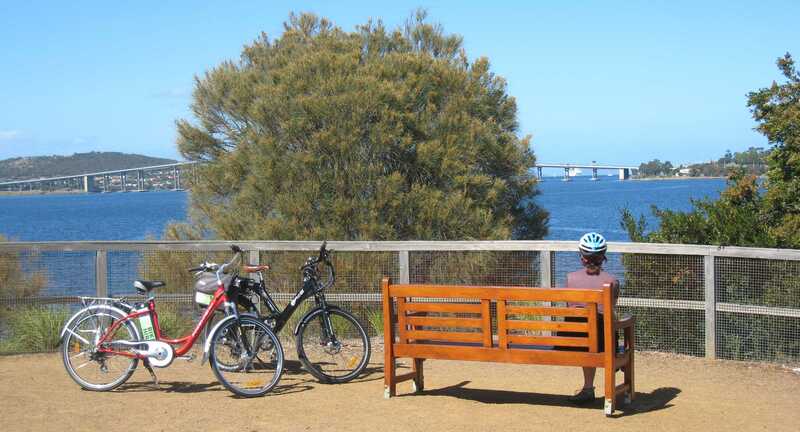 You can choose your own pace for a thrilling 20km downhill ride back to Hobart City. You will still have plenty of energy to keep exploring, or drop into the Convict built Cascade Brewery for a little refreshment. Or return via Ridgway and the beautiful bushland reserve of Waterworks Reserve for a taste of Tassie wilderness less than 5 ks from the city centre. We can supply you with a bikes, helmets and a map for this DIY adventure. The cost for 4 people would be around $37.50 pp. For some ideas on things to do in Hobart, call now on 0447 556 189 or use the form below!